May 6, 1954, is the 6Oth anniversary of one of the most historic athletic achievements of all time. It was on that day in Oxford, England, a twenty-five year old medical student by the name of Roger Bannister broke a time barrier in the mile run that was once thought impossible. For years athletic physiologists said it was impossible for the human body to endure the strain of running a mile in less than four minutes. Their conclusions seemed to be verified by the fact that since 1945 the mile world record had been stuck at 4:01.2 by Gunder Hagg of Sweden. Bannister refused to accept the conclusions of those who said running a mile under four minutes couldn’t be done. He applied himself to studying nutrition, training methods, and the psychological aspects of running. He made his goal to prove the “nay-sayers” wrong. He dedicated himself to be the first man to break the thought-to-be impossible barrier. After months of intense tainting and carefully choosing world class runners to help pace him in his record attempt, he was ready. On May 6, 1954, he arrived at the Iffley Road track in Oxford for what he hoped would be an historic day. Conditions were anything but ideal, as a crosswind was blowing and the dirt track was wet from rain that had fallen. Ready physically and mentally, Bannister refused to postpone his attempt even though he had hoped for better weather. When the starting gun sounded to begin the race, Bannister’s pacesetter did their job perfectly carrying him through the three-quarter mile mark in 3:00.7. Needing a last lap in 59 to accomplish his goal of becoming the first man to break four minutes for the mile, he summoned every ounce of strength within him as he strained for the finishline. Crossing the white-chalked-line he collapsed in exhaustion into waiting arms. As he broke the tape the stopwatch read 3:59.4. He had accomplished what was once thought physically impossible. His accomplishment was a “barrier-busting” accomplishment and ranks as one of the most historic athletic achievements of all time. Bannister sought to prove that the human body can achieve more than thought possible if it is highly trained and the person believes in what they are doing. Being a lifelong runner and a coach for 40 years I always tell runners you can accomplish more than you think you can if you train hard enough and have confidence in yourself. Now if the human body can reach heights once thought impossible, then how much more the Christian can reach new heights spiritually as we have available to us a power not of this world. Jesus said, “Ye shall receive power after the Holy Spirit is come upon you” (Acts 1:8). Paul informs us a marvelous truth, that the same “Spirit of him that raised up Jesus from the dead dwells in you, he that raised up Christ from the dead shall also quicken your mortal bodies by his Spirit that dwells in you” (Romans 8:11). Did you get that?! The same Spirit that raised Christ from the dead dwells in the believer! WOW! Since the same power that raised Jesus from the dead dwells in us, we can victoriously say with Paul, “I can do all things through Christ who strengthens me” (Phil. 4:13). Greater is He who lives within us than those worldly forces that seek to drag us into defeat (I John 4:4). What are you facing today? The devil may tell you that it is impossible to achieve victory over it and through it. While you and I might not to be able to run a four minute mile like Roger Bannister, you and I as believers possess a spiritual power within us that helps us face in victory whatever circumstances and situations life throws our way. We may grow spiritually weary at times, but our Savior is always waiting with open arms to receive us and strengthen us. Bannister knew that his superb physical condition would overcome the adverse conditions that confronted him that day. In like matter, any adverse conditions we encounter in life we can face them in the power of Christ who strengthens us. 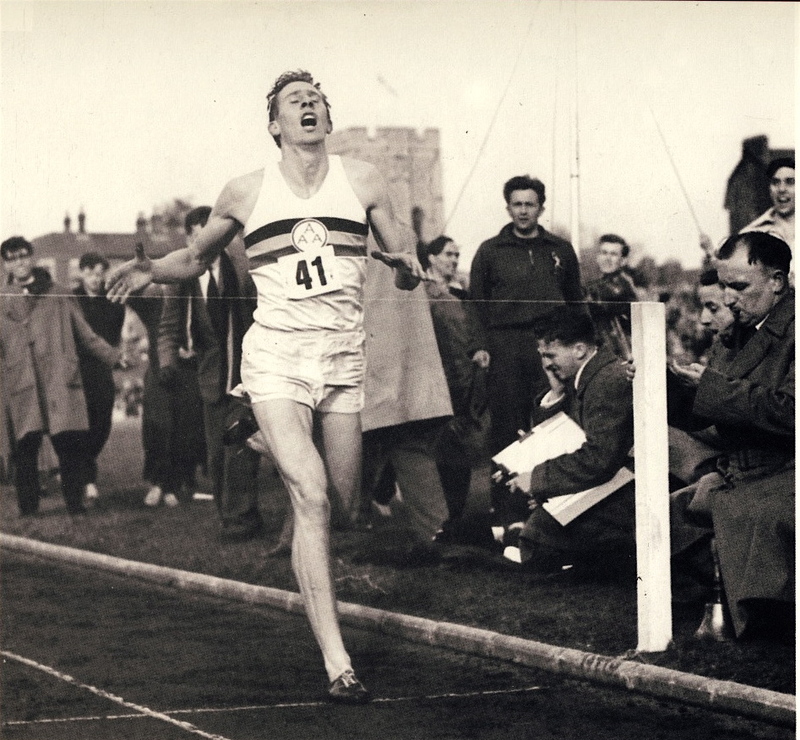 As Bannister ran into athletic history on May 6, 1954, a cheering crowd joyfully greeted him in his victory. As you and I run the race of life, because of Him who dwells within in us, we can joyfully sing “Victory in Jesus” every mile of the way.